See attachment to learn about resources for Prince William County residents and other surrounding jurisdictions. Also, if you live in Fairfax County, read the article and information below. It details several services provided such as discounted camp, free transportation and several resources for federal employees. No one can avoid the unexpected. With thousands of residents in our community impacted by the government shutdown, coping can be hard. Research shows that people react differently to uncertainty, and that those with a higher intolerance for uncertainty may be less resilient and more prone to low mood, negative or down feelings and anxiety. Engage in self-care. Don’t let stress derail your healthy routines. Make efforts to eat well, exercise and get enough sleep. Many people find stress release in practices such as yoga and meditation. Seek support from those you trust. Many people isolate themselves when they’re stressed or worried. But social support is important, so reach out to family and friends. Control what you can. Focus on the things that are within your control, even if it’s as simple as weekly meal planning or laying out your clothes the night before a stressful day. Establish routines to give your days and weeks some comforting structure. Be kind to yourself. Some people are better at dealing with uncertainties than others, so don’t beat yourself up if your tolerance for unpredictability is lower than a friend’s. Remind yourself that it might take time for the stressful situation to resolve and be patient with yourself in the meantime. Develop new skills. When life is relatively calm, make a point to try things outside your comfort zone. From standing up to a difficult boss to trying a new sport, taking risks helps you develop confidence and skills that come in handy when life veers off course. Limit exposure to news. When we’re stressed about something, it can be hard to look away. But compulsively checking the news only keeps you wound up. Try to limit your check-ins and avoid the news during vulnerable times of day, such as right before bedtime. Avoid dwelling on things you can’t control. When uncertainty strikes, many people immediately imagine worst-case scenarios. Get out of the habit of ruminating on negative events. Take your own advice. Ask yourself: If a friend came to me with this worry, what would I tell her? Imagining your situation from the outside can often provide perspective and fresh ideas. Be aware of local resources. If you’re feeling concerned and considering whether or not you or someone you care about may benefit from a mental health professional,take an anonymous online screening. The CSB offers workshops through the Merrifield Peer Resource Center that are open to the general public, including a mindfulness group at the Merrifield Center each Tuesday at 2 p.m. and Art Therapy each Monday at noon. Call 703-559-3100 for more information. 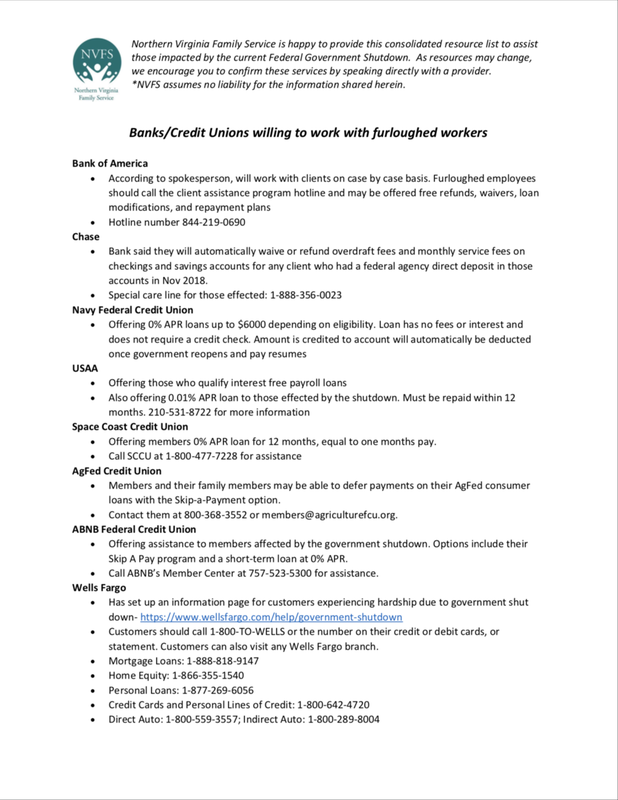 Get more information about assistance and resources in Fairfax County for furloughed workers.